Before there were cellphones, the Internet and Wii, there was piko, sipa, tumbang preso, lakad lata, Chinese garter and patintero. 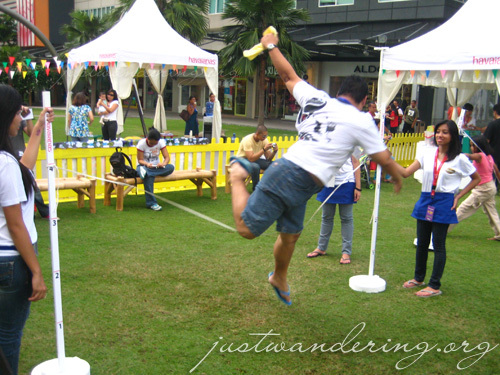 Havaianas turned part of Bonifacio High Street into a playground for kids and the kids at heart, with game stations for different Filipino games that we played when we were kids. It was a great project, since we hardly see any kids playing these games in the streets (then again, Metro Manila’s streets aren’t the safest place to play in). It made me smile seeing young kids learning about these games, adults reliving their childhood and enjoying the games they used to play, and this one Caucasian mother with her two children, having fun playing Filipino games. 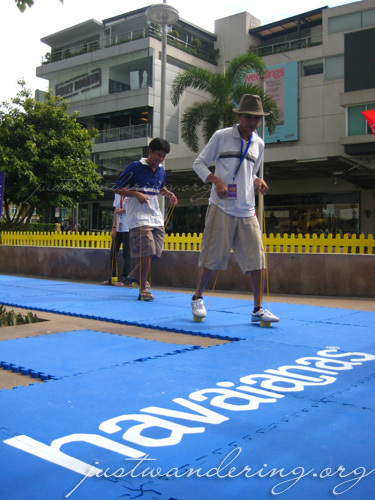 AJ and Marc racing at the lakad lata (walking on cans) station. I’m not really into these games when I was a kid (really, I hardly went out of the house to play when I was little), so I just stood in the sidelines, taking photos and videos of my friends having fun. Things were just getting interesting over at the lakad lata section, when the guy taking videos of the event started directing the players where to go. The same thing happened in the patintero section, where he proceeded to order everyone around and telling them to let the other team pass. I can sense that the players only had fun during that brief 1-minute of play when he wasn’t ordering them around. RELATED: Did you see the Airbus A380 in Manila? Just to remind everybody, I’m currently running three contests on Justwandering.org. You can win a Mother Earth bag, a Wii Night at Redbox or a bag from Bratpack! thy post reminded me of my patintero days in the unpaved sampaguita street in bulakan. nice post. hahaha… im not sure if i can still play those games. but it’s really good to spend some time playing this games to at least remind the new generation that there’s more to playing wii! I miss seeing you around Nina! It’s been a while since we last bumped into each other. Bet it was super fun! !